Lompoc Valley Medical Center provides 24/7 access to neurology specialists who can conduct audiovisual consultations with on-call neurologists at Cottage Health through a “virtual doctor” robot (pictured). Now that collaboration is in the process of becoming official, due in part to a piece of legislation that went into effect on Jan. 1, authorizing the relationship. The law, Assembly Bill 653, was penned by Assemblyman Jordan Cunningham (R-San Luis Obispo), who said the partnership is an effort to bring increased health care services and accessibility to residents of Lompoc. 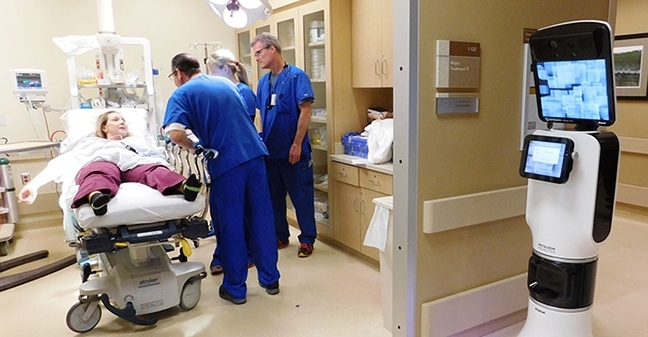 While Lompoc Valley Medical Center provides a wide array of services, Cunningham said it has always struggled to recruit all kinds of medical professionals, from primary care physicians to nurses. Lompoc’s cost of living really isn’t dramatically lower than other parts of Santa Barbara County, and for most people considering living on the Central Coast, Lompoc wouldn’t be the first choice. Lompoc’s medical center is also at least 40 miles away from another hospital in every direction, Cunningham said, a somewhat long distance for patients who have been referred to specialized care. The new law allows Lompoc Valley Medical Center, a public institution, to form a Joint Powers Authority with Cottage Health, a nonprofit. It’s a model that Cunningham said a number of other health care providers have used to successfully tackle similar issues of access, and he hopes it will help these local organizations do the same. Although the organizations remain separate, unaffiliated entities, the partnership could benefit both in varying ways, according to Nora Wallace, public relations coordinator at Lompoc Valley Medical Center. In recent years, Lompoc Valley Medical Center and Cottage Health have developed a successful telemedicine program for neurology consults—to relay information quickly when minutes matter most—and have partnered on effective transfer protocols for newborns needing neonatal intensive care at Cottage Children’s Medical Center. Physician residents from Santa Barbara Cottage Health’s Graduate Medical Education program also rotate to Lompoc, where they learn about providing care in a rural acute care hospital setting. Along with the patient transfer and referral process, Wallace said those programs could likely become more efficient through this official partnership. Still, she said nothing has been decided, and the organizations are working out the best ways to meet the health care needs of the Central Coast. A representative of Cottage Health, Maria Zate, made similar statements.